Starting July 1, The Association of Equipment Manufacturers will be accepting nominations of industry leaders to its Hall of Fame. The goal of the program is to create a wider public understanding and appreciation of the industry's role, in the past and for the future, in global economic and social prosperity. Nominations must be made online at the <a href="http://www.aemhalloffame.com/">Hall of Fame</a> site. The Common Ground Alliance (CGA), the nation's leading organization dedicated to protecting underground utility lines and the safety of people who dig near them, today announced a partnership with The Home Depot to educate customers on the importance of calling prior to digging. The National Association of Sewer Service Companies (NASSCO) Board of Directors has selected Ted DeBoda, P.E., to succeed Irvin Gemora as Executive Director. DeBoda is currently manager of the URS Corporation’s Baltimore Office. Salina, KS, city personnel began in 2009 to explore the various replacement methods and procedures to replace an aging 12-inch, vitrified clay pipe (VCP) gravity sewer with a 24-inch pipe line for needed increased capacity. Teams cleaning up after the oil spill in the Gulf have deployed a new tool to help with their efforts--McLaughlin vacuum excavators. Vacuum excavators are being deployed on barges into the Gulf and used to remove oil from the miles of skimmers located along the Gulf Coast. <em>Rigonomics: [n.] efficiently and effectively conducting HDD operations to ensure maximum profits</em> Plan the work, work the plan -- good advice no matter what the job. On construction projects, failure to properly follow that simple advice can result in lost and wasted time, costly errors and accidents. As the current recession begins to ebb, market stabilization in 2010 seems to be a viable goal for many contractors in the underground construction market, with many areas still struggling to survive another tough year. Electrical cable for power distribution systems has been placed underground for decades. In fact, it would be unusual today to even consider installing aerial power or communications cable in a new residential development, office park, government or institutional campus. Hope Crossing, a suburban housing development in northeast Oklahoma City, may not look much different than other housing additions of attractive, moderately-priced homes, but it is unique. Hope Crossing is the largest “green” Habitat for Humanity housing development in the United States. <em>Pipeline & Gas Journal</em>, in partnership with the Interstate Natural Gas Association of America (INGAA), presented its sixth annual Pipeline Opportunities Conference on March 31 in Houston. Jeff Share, conference founder and organizer, said the single-day event drew more than 500 attendees at the George R. Brown Convention Center for the third consecutive year, attesting to the intense interest in the pipeline industry. In less than six months, the U.S. Environmental Protection Agency (EPA) Interim Tier 4 emission standards will go into effect for many types of off-road diesel powered equipment used in underground construction, and equipment owners and operators are devoting increasing attention to the changes they will bring. ITT Corporation announced June 21 that it intends to buy Godwin Pumps for $585 million. The deal brings the world's largest manufacturer of submersible pumps together with the largest producer of diesel-driven dry install pumps, and the combined organization is expected to become the largest company providing drainage pumps serving the global industrial, construction, mining, municipal, oil and gas segments. Updates from Akkerman, GTI, Vermeer, CONTECH, Caterpillar, Ditch Witch, CNH, ADS, Lockwood Andrews & Newnam, SAK and more. Two North American firms that specialize in horizontal directional drilling, Brotherton Pipeline and Direct Horizontal, have merged their equipment and workforce to form Brotherton-Direct. Advertisers in the print edition of Underground Construction, June 2010, Vol. 65 No. 6. Southeast Directional Drilling has acquired the assets of Frontier Pipeline, a Minnesota-based horizontal directional drilling (HDD) company. Financial terms of the acquisition were not disclosed. ISCO Industries, a Louisville, KY-based distributor and fabricator of piping products, recently held an open house in its newly refurbished and enhanced Houston facility. The facility was updated to offer more services and solutions to customers in the area. Case Construction Equipment announced the production startup of a new line of military skid steers and compact track loaders. Case has begun manufacturing and shipping the first of several thousand model M400W skid steers and model M400T compact track loaders. PipeLine Machinery International (PLM), Caterpillar’s global pipeline equipment dealer, has recently teamed with Cranesmart Systems and is the exclusive distributor of the Pipelayer System, the industry’s first wireless load monitoring indicator (LMI) system for pipelayers. TERRA AG has developed a manhole HDD drill that is able to undertake directional bores from manhole to manhole and from manhole to all near-by homes. At 2.5-feet depth, telephone cables can be laid; water lines at 4-inch depth, and gas or power lines at 5 feet. The Griffin Electric Wellpoint Pump, model 6WPRE, features fully automatic, dry priming and dry running, self-contained, portable dewatering pump. Leica PowerDigger 3D expands on the unique PowerSnap concept, which provides total flexibility and interchangeability of machine control products and of machines such as excavators, dozers and graders. The 324 compact excavator is a conventional tail swing unit in the 1.5-ton operating class. Its boom cylinder is attached to the top of the boom instead of the bottom, giving it more protection from damage while digging. SaniTite HP pipe, manufactured by Advanced Drainage Systems (ADS), now meets the requirements for ASTM Standards F2736 and F2764. The HL770-9 wheel loader features an all new load sensing hydraulic system with more efficient variable volume pump technology, fully automatic power shift transmission with variable shift control, multi-stage clutch cut-off and integrated payload system. The EW230C wheeled excavator is built around a new, more robust platform, which is designed to ensure the stability needed to manage bigger loads, for heavy lifting applications, such as laying big pipe for drainage projects, or hard digging. The new DL420 articulated wheel loader boasts a larger, more powerful diesel engine than the model DL400, which it replaces. The patented UNIHammer rock tool provides more distance per hour, per day, on your bores than ever before. It’s really only been a little over 20 years since horizontal directional drilling effectively became mainstream for all rig sizes. In that time, the technology has progressed from a unique method for installing large diameter steel pipes under streams and rivers, to a procedure that can now shoot a tiny conduit from street curb to home. Check out the Equipment Selection Guide to see specs for each manufacturer's products, from auger boring to wheel loaders and more. David Michaels, the new administrator of the Occupational Safety and Health Administration (OSHA), is turning up the heat on industry, and critics of the agency under George W. Bush are pointing the Obama administrator toward the pipeline and underground construction industries. 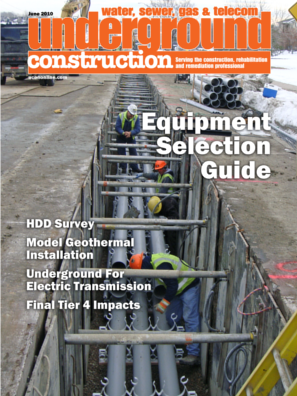 The Plastics Pipe Institute Inc. (PPI) has published new guidelines in Technical Report TR-46 for the placement of flexible high-density polyethylene (HDPE) pipe using mini-horizontal directional drilling (mini-HDD) techniques.